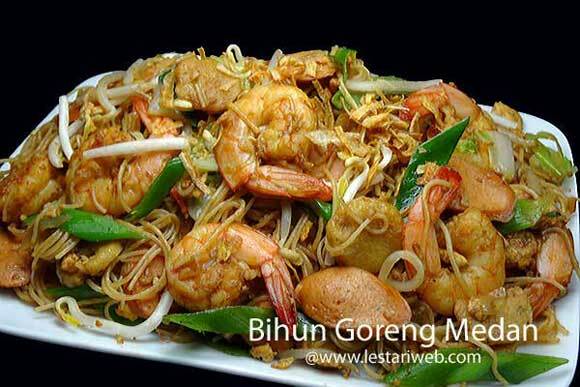 This is the famous everday street food of Medan, the capital city of North Sumatra Province: Bihun Goreng Medan. You can find this fried noodles almost in each corner of the city and now is gaining more popularity in many big cities throughout Indonesia even in Singapore! 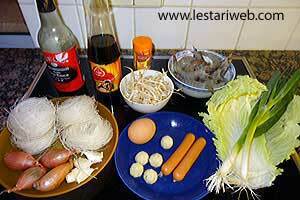 What makes Bihun Goreng Medan so special??! Well..maybe because of it's richness of aroma and taste! 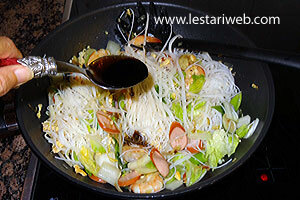 The rice noodles are tossed with eggs and fresh shrimps, accompanied by a generous amount of fresh vegetables like coy sum, spring onion, bean sprouts then adjusted with the last touch of kecap manis! Hmm...yummy. 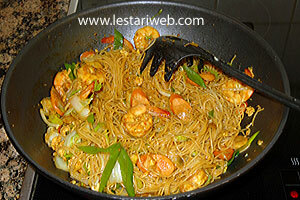 This is one of a must-order dishes if you visit Medan ;-). Soak the rice noodles by adding to warm water (until al dente) *** according to package directions and set to drain in a colander. Don't boil otherwise the noodles will be too soft. 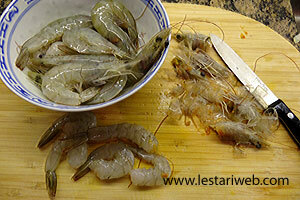 Clean the shrimps, peel-off the shells and devein by cutting the back of the shells and clean in running water. Set aside to drain. Wash and slice the vegetables, beat the eggs. Put aside. 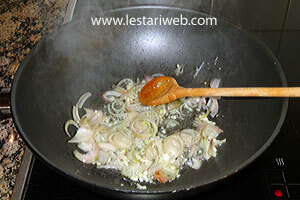 Heat 3 tb oil in a frying pan/wok, stir-fry the garlic and shallot over medium heat until fragrant. 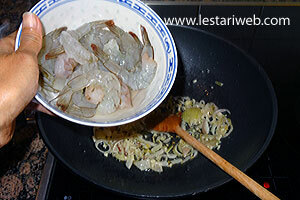 Add the shrimps, stir-fry until the the shrimps's colour turns to red. 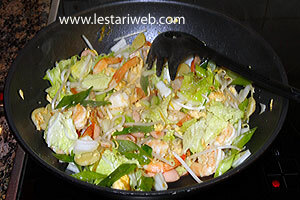 Push the shrimp and spices little bit to the edge of the wok's surface, add the beaten eggs, stirring quickly to get it scrambled. Mix well with others. 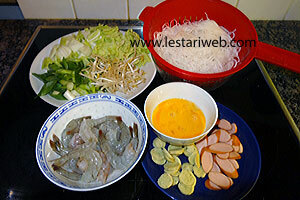 Add coy sum, spring onions and rice noodles. Stir to mix quickly. 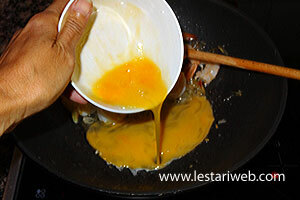 Add soy sauce, kecap manis, pfeffer and chicken broth. Stir quickly until the vegetables just wilted. Adjust the seasoning. Add salt to taste if necessary. Add the beans sprouts, stir to mix and remove from heat. 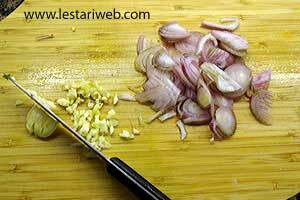 Serve hot & garnish with fried onions. 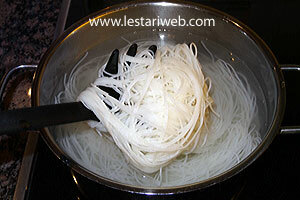 *** Some rice noodles product suggest to soak in cold water instead. Read the package instructions carefully.